The 10th International workshop on top quark physics, TOP2017, was held in Braga, Portugal, from September 17th to 22nd, 2017 and brought together a number of experimentalists and theorists from all over the world. The CMS Collaboration presented eight new results during the conference covering a variety of precision measurements using top quark events as well as searches for rare processes sensitive to beyond-the-standard model (BSM) effects. One of the highlights was the first observation of top quark production in proton-nucleus collisions (Fig. 1). This measurement, consistent with the predictions from perturbative quantum chromodynamics, paves the way towards future detailed studies of top quark production in heavy ion collisions. Fig. 1: Invariant mass distribution of the hadronic top-quark candidates in selected events with 2 b-tagged jets. Precision measurements using top quark pair (ttbar) events in proton-proton collisions were also presented. This includes measurements of the ttbar differential and double-differential production cross section with respect to the properties of the ttbar system and as a function of top-quark related kinematic variables. The measured cross sections are compared to state-of-the-art ttbar simulations and higher-order calculations (Fig. 2). Fig. 2: Differential ttbar cross section at parton level as a function of the pT of the hadronically decaying top quark. The measured cross section is compared to state-of-the-art Monte Carlo generators and theoretical calculations. A precision measurement of the top quark mass using ttbar candidate events and the full 2016 dataset was also presented. The analysis uses new simulated samples and a refined estimation of the modeling uncertainties to study the dependence of the measured mass value on the kinematic properties of the events. 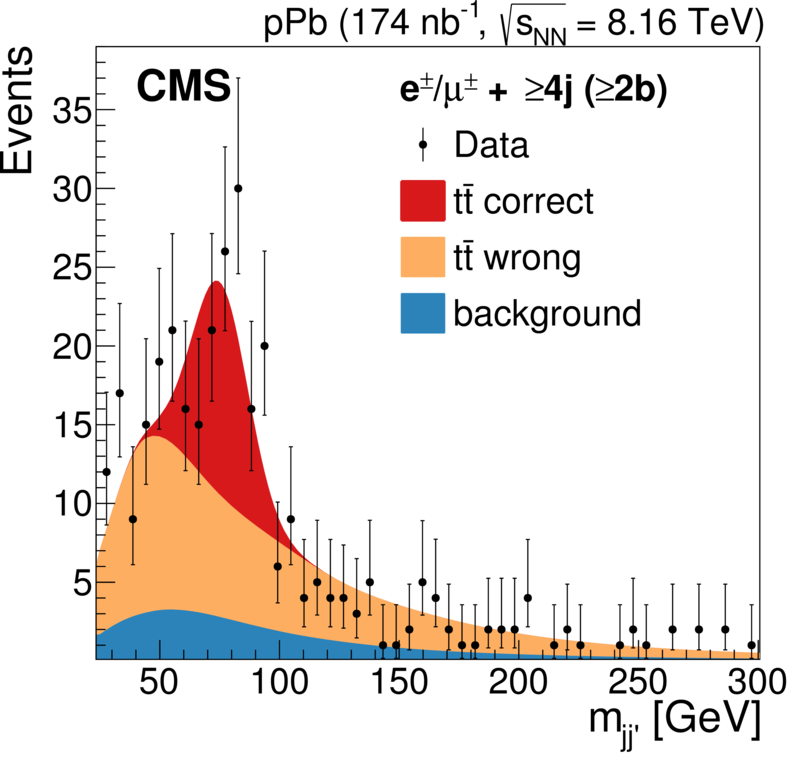 The result has a relative uncertainty below 0.4% and is consistent with the most precise measurement of the top quark mass, obtained from a global combination of CMS Run 1 results. Two other notable results presented at TOP2017 cover single top quark production. This includes evidence for the standard model (SM) production of a Z boson in association with a single top quark. This production mechanism, leading to a final state with a single top quark, a Z boson, and an additional quark, denoted by tZq, is a very rare but important process that can probe the standard model in a unique way. It is sensitive to the top coupling to the Z boson, to the triple gauge-boson coupling WWZ and also to flavor changing neutral current (FCNC) processes. Evidence for tZq production was reported with an observed (expected) significance of 3.7 (3.1) and the measured cross section was found to be compatible with the SM prediction. Another highlight was a measurement of the production cross section for a single top quark produced in association with a W boson. 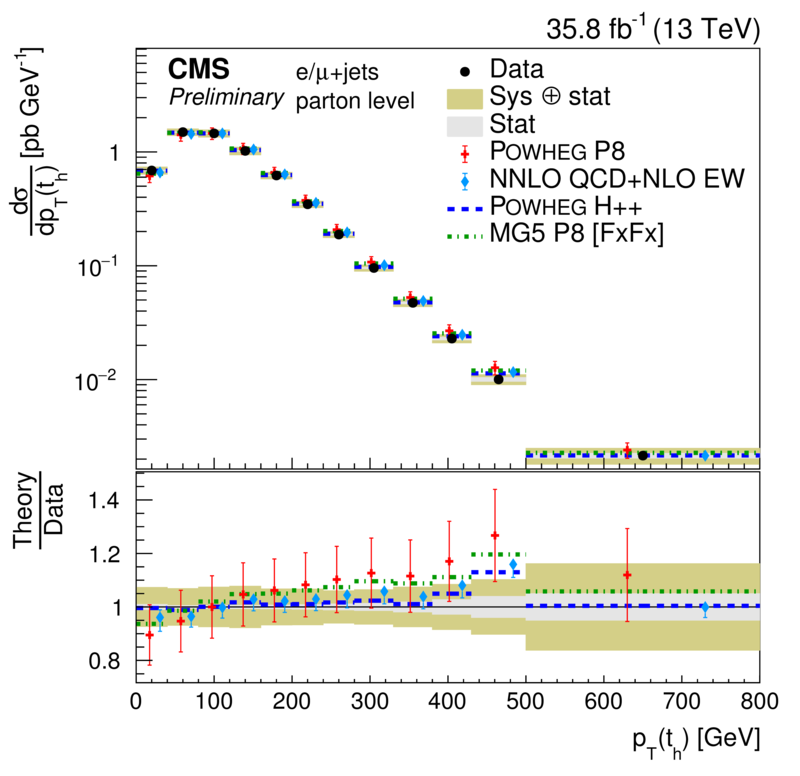 This is a first measurement of this process by the CMS experiment at 13 TeV and utilizes the full dataset collected in 2016. The measured cross section is consistent with the SM predictions and is currently the most precise measurement available (10.5% uncertainty). Four top quark production, an extremely rare process, is sensitive to a number of BSM theories and also helps constrain the Yukawa coupling between the top quark and the Higgs boson. The analysis presented by CMS explores the dilepton same-sign and multilepton final states, using the full 2016 dataset. The observed (expected) significance is measured to be 1.6 (1.0) standard deviations, making this the most sensitive analysis to date. A new search for flavor-changing interactions of the top quark with the Higgs boson in the H→bb channel using 2016 data was also presented. The analysis explores two channels: top quark pair production, with FCNC decay of the top quark or antiquark, and single top production along with the Higgs boson (tH). This is the first analysis to probe top-Higgs FCNC couplings in the single top quark production mode. Another important result, presented for the first time, was the combination of the inclusive and differential ttbar charge asymmetry measurements using ATLAS and CMS data at 7 and 8 TeV (Fig. 4). The individual results and the combinations are in agreement with SM calculations and uniquely restrict the phase space of possible BSM phenomena which would produce asymmetries larger than the SM ones. Fig. 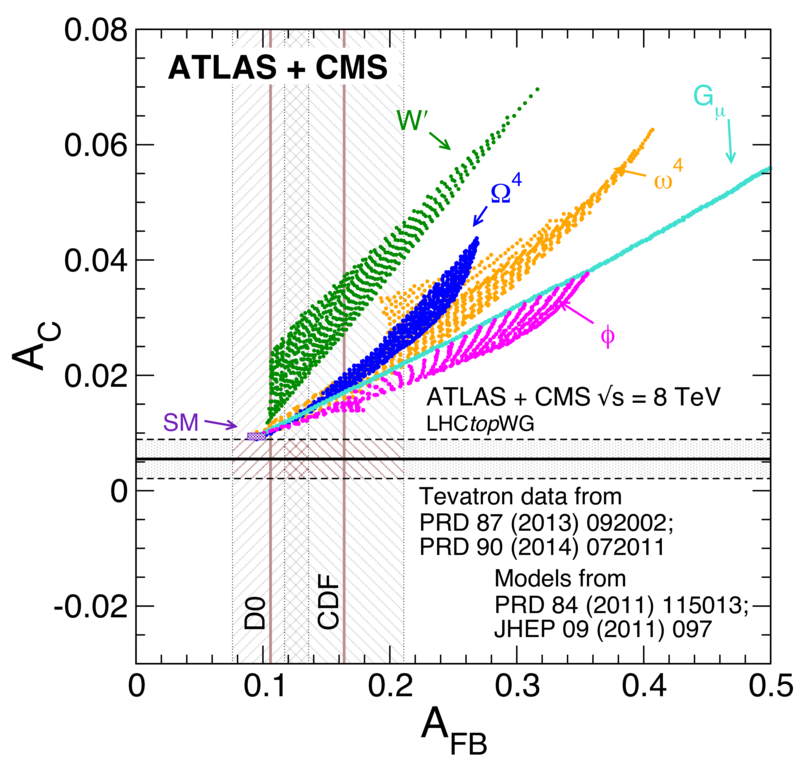 3: Measured inclusive charge asymmetries at the LHC at 8 TeV (horizontal line) versus forward-backward asymmetries (vertical lines) at the Tevatron, compared with the SM prediction and also predictions incorporating various potential BSM contributions.